A group of visitors from Panama donned dirndls and lederhosen for the Oktoberfest celebration in Vail Village. Vail Resorts is putting some of its marketing muscle into the Panamanian market, aided by a direct flight from Panama City to Denver. • It’s a six-hour flight from Panama City to Denver. • Panama City is a major hub for air service in Central and South America. • A winter round trip on Copa Airlines from Panama City to Denver is currently $699. • The Panamanian Balboa is tied to the U.S. dollar. The exchange rate is 1:1. VAIL — Ernesto “Tito” Orillac first came to Vail from his native Panama when he was 9 years old. More than 30 years later, Orillac is working to bring more of his countrymen to the resort. Orillac is working with Vail Resorts to build visitation from Panama, Central America and Columbia. 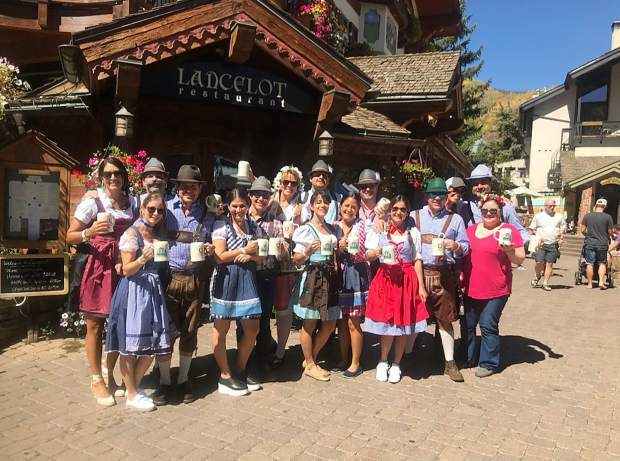 As part of that effort, he recently led a group trip to Vail that included shopping, dining and a dirndl-and-lederhosen-clad trip to the Oktoberfest celebration in Vail Village. While foreign visits to the Vail Valley and other mountain resorts have dipped, Vail Resorts is looking to Panama for a boost. While the strength of the U.S. dollar has played a role in that dip, the Panamanian balboa is tied to the dollar, which means buying power remains constant. Panama is also relatively affluent. The country of 6 million people is the second-largest free-trade zone in the world, Orillac said. As much as 10 percent of all the world’s trade moves through the Panama Canal, and the country has seen strong economic growth over the past several years. That’s made the Panama City airport a growing hub for travel both in Latin America and to the United States. The direct flight from Panama City to Denver means travelers can clear customs before their flight. “It’s much easier than flying through Miami,” said Jenny Viditz-Ward, Vail Resorts’ international market manager for Central and South America. And, Orillac added, Panama’s long ties with the United States mean there are many similarities between the countries. A lot of Panamanians come to college in the United States, he said, which is how many are introduced to winter sports. Viditz-Ward said Orillac’s company every year brings between 700 and 900 Panamanian and other visitors to Vail Resorts’ various resorts. Vail is the most popular destination. Orillac said most of those visitors are families, adding that in the next year he already has bookings for several groups of 30 to 45 people. Those groups aren’t exactly traveling together, but will see one another while they’re on vacation, from ski days to dinners to summer tours and golf. Many of the kids in those groups attend the same schools, he said. Getting families to come is one way of marketing trips to the United States, he said, since kids almost always talk to classmates about their family vacations. Part of the attraction for families is the ability to both spend time together, as well as the fact that families can let their kids indulge in some unsupervised exploration of the town. Those visitors also tend to stay for a while, Orillac said. While ski trips are popular, Viditz-Ward said Vail Resorts’ Epic Discovery summer programs are becoming known. The winter Epic Pass is already popular, Orillac said, and customers tend to remain loyal. Then there’s the fact that there’s more to Vail than just skiing in the winter. “There’s something for everyone,” Viditz-Ward said. Those options grow in the summer, from golfing to rafting to fishing to horseback rides. As a way of promoting the Vail Resorts brand in Panama, Orillac said there’s a Vail-themed golf tournament scheduled for January in Panama. “At the end of the event, there’s about 200 to 300 people hearing about Vail summer, and how exciting it is to play at (Vail’s) elevation,” he said. Besides bringing Panamanians to Vail, Orillac said the Copa Airlines flight to Panama City is a good opportunity for people in Colorado to visit Panama. A winter round-trip flight from Denver to Panama City is currently $699. A summer flight is $399 at current prices. Orillac said he’s had great response to his efforts.